Bryan Tusch started writing in 2010. He has a career in nutrition and high school coaching. He is a former pastry chef with an associate degree from Johnson and Wales University. In 2009 Bryan completed his Bachelor of Science in dietetics/nutrition from the State University of New York College at Oneonta. You are at the grocery store browsing through soft drinks you begin contemplating whether you are making a healthful decision. You know about the negatives of soda. You consider the two liter cola bottle you pick up every Sunday morning, but instead, you grab the soda your mom and grandmother gave you when you were had an upset stomach -- Canada Dry Ginger Ale. 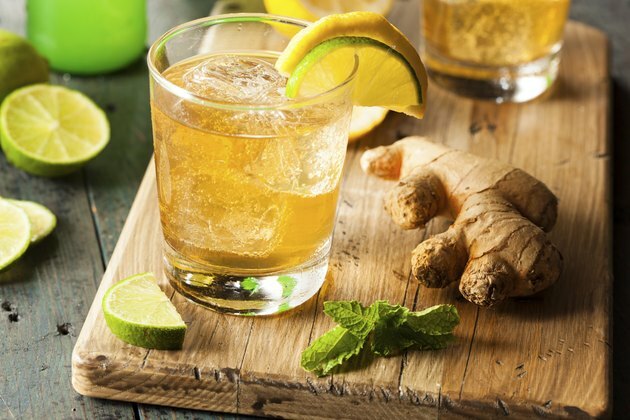 Canada Dry ginger ale uses real ginger, but is it a better alternative than other soft drinks? The best way to determine that is to look at the nutrition label. If calories are too high, the body will story the energy as fat. Carbohydrates, protein and fat each provide calories to the human body. Understanding the nutrition label and ingredient list will aid you in making a smart choice. Canada Dry Ginger ale provides, per 8 oz serving, 90 calories and 25 g of carbohydrates, 24 g of which are from sugar. The other ingredients are carbonated water, high fructose corn syrup, citric acid, sodium benzoate, which is a preservative, natural flavors and caramel color. Canada Dry Ginger Ale provides all its calories from sugar, giving quick bursts of energy despite being caffeine free. Canada Dry has 90 calories per serving. It does also contain some ginger extract. In China, ginger has been used to aid digestion and treat upset stomach, diarrhea, and nausea for more than 2,000 years. Ginger has also been used to help treat arthritis, colic, diarrhea, and heart conditions. Unfortunately, Canada Dry Ginger Ale contains sodium benzoate, which, when in contact with intense light and heat, can produce traces of benzene. Benzene is known to cause cancer and birth defects and can be found in cigarette smoke and gasoline. When choosing Canada Dry Ginger Ale, drink in moderation. Too much can lead to excess calories for your body. A two liter bottle of Canada Dry has 780 calories, so if you drink a two liter bottle of Canada Dry a week, that equals 40,500 calories in a year. If these calories are not burned off by exercise, you can gain up to 11 pounds of fat per year just from ginger ale. It contains phosphoric acid as a preservative where higher amounts are found naturally in orange juice and lemonade.